Decorative Life: Years, some say forever! Increasing levels of nitrogen fertilization and/or decreased calcium levels during production can worsen the damage induced by chilling temperatures. To the contrary, low nitrogen and high calcium levels can reduce chilling-induced damage. Common family members are agave, tuberose, yucca, pony tail and dracaena. Leaves are long, thick and often multi-colored with creamy-colored leaf margins. 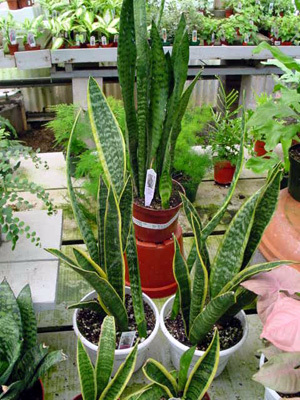 ‘Hahnii’ and ‘Compacta’ are dwarf sports (often referred to as Birdsnest Sansevieria) whereas ‘Laurentii’ has bright yellow margins and goes by the common name of Gold Band Snake Plant. Underground stems (rhizomes) are common. Chill sensitive, store and ship above 50F. The specific epithet name trifasciata means three-banded, probably in reference to coloring/design of leaves. Sansevieria named after Raimond de Sangro, Prince of Sanseviero, born in Naples in 1710. The common name Snake Plant refers to the leaf markings while Mother-in-Law Plant is in reference to its sturdy, if not indestructible, nature! Along with the Cast-Iron Plant, they are probably the most neglected indoor plants that survive. Will grow well in light levels bright enough to read a newspaper in comfort even though they are often exposed to lower light levels and still survive.